I’ve been known to buy wacky things in the name of health (like the diva cup and Ayurvedic Oil Pulling Rinse ) so when I saw a giant Himalayan salt lamp at my local home goods store, I HAD to buy it. I didn’t buy it just because it’s beautiful; I bought it because of its purported health benefits like an increased sense of calm and daily stress relief. 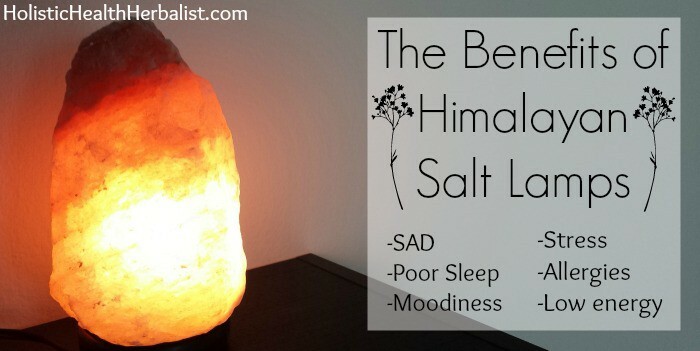 A Himalayan salt lamp is made from a large hunk of Himlayan salt that has been hollowed out. A bulb is inserted through the hole at the bottom and then a wooden base is attached. Most Himalayan salt lamps will have a simple on and off switch, but others will have “dimmers”. I suggest NOT getting the ones with dimmers due to their EMF output (I’ll touch more on EMFs later in the article). I have always preferred the rough chunks of salt for my lamps as they look like art pieces from nature. Each lamp emits a pleasant orange glow that makes any space in your home ambient and peaceful. Have you ever had the urge to inhale deeply after a thunderstorm, while strolling the beach, or when hiking near a waterfall? The reason may be because the air is charged with negative ions and your body wants more of them. What is a negative ion you ask? In essence, a negative ion is a molecule of oxygen that has gained an electron. Carbon dioxide is a positively charged ion, meaning it has lost an electron. Both positive and negative ions exist in the air we breathe. To make is easy to understand, negative always attracts positive. The negative ions attract and bind to the positive electrons making them inert. Just like pure beeswax candles, Himalayan salt lamps have the ability to release negative ions into the air. The salt attracts moisture from the air and evaporates it quickly from the heat of the lamp. This simple process is what creates the negative ions. Airborne debris like dirt, dust, pollutants, pollen, and other allergens all carry a positive charge. This allows them to float around in the air where they are easily breathed in. The negative ions released by the Himalayan salt lamps bind to the positively charged debris and make them drop harmlessly to the floor. One great thing about Himalayan slat lamps is their affordability compared to machines you can buy for the same effect. Personally, I love the soft ambient glow of these lamps and now have 3 of them in my apartment. I can easily sleep while one of them in on in my bedroom and they are the perfect night light to use in the kitchen and bathroom. Another great benefit to having a beautiful salt lamp in your house is its ability to detoxify EMFs. In case you aren’t aware, EMFs are the electromagnetic frequencies emitted from electronics and are considered dangerous to our health. Growing research suggests that high amounts of EMS can contribute to sickness and disease. Now more than ever our bodies receive these artificial electromagnetic wavelengths in staggering amounts, up to 20x more than we’re used to. Using Himalayan salt lamps in your home can help neutralize the elctro-smog microwaves, electric ovens, computers, and cell phones produce. To help negate EMFs, you can buy a USB salt lamp to keep at your computer so that you can take a beautiful salt lamp wherever you go. You may be surprised to know that the lamps themselves do not produce negative ions. While the salt is hygroscopic, meaning they attract moisture, the lamp will not produce negative ions until it is heated. It is the evaporation of the moisture from the salt that lends salt lamps their health benefits. To use a Himalayan salt lamp most effectively, keep it lit as often as possible. I try to keep mine on 24/7 and I can really tell a difference. 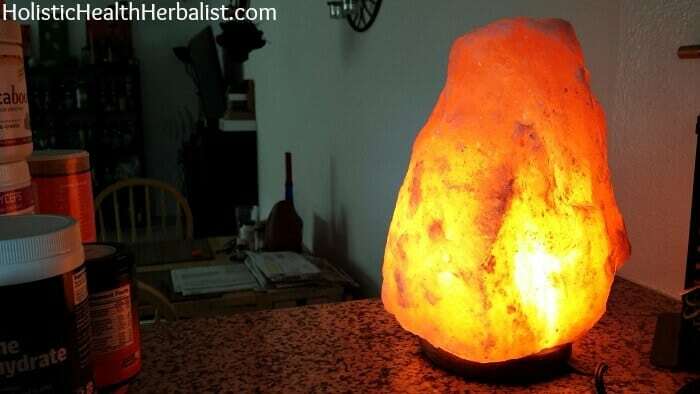 Having more than one salt lamp in each room or in the rooms you frequent most will give the best results. Also, if you are treating seasonal allergies it is best to keep the lamp on all day and to close your bedroom door and windows to allow the negative ions to build up and circulate throughout the room. Himalayan salt lamps will last indefinitely. It is the lightbulb inside that will need to be changed out on occasion. You can typically find these bulbs at your local home improvement store or online here. Do you have any salt lamps in your home? You may also like to check out my article on Himalayan salt inhalers. To learn more about Himalayan salt and Himalayan salt lamps, check out this article by Dr. Mercola. I discovered hundreds of ants living in my salt lamp this morning! I’ve read that ants prefer salt over sweet but we live near the ocean so I am confused as to why they would make a home in my salt lamp? How do I prevent them from making a home there? Also, on humid days when there is alot of salt in the air from the ocean, the salt lamp leaks. Is this normal? If you live in humid environments, the salt lamps tend to “weep”. I had one that was too close to my bathroom and I ended up having to move it to a dryer location in my house to dry out the lamp and stop the leaking. I wonder if the ants are attracted to the moisture of the lamp? Ants will avoid cayanne pepper. I used to mix with sugar and put a thick line of it at the entry point into the house. Diatomacious earth kills them. get food grade if you have pets. Hi, when I touch my lamp it doesn’t feel warm. Have you heard of the using led lights or something that wouldn’t heat up. I know that it’s important for the lamp to heat up because that’s what helps release healing salt particles into the air. I wonder if it’s possible to switch out the bulb you’re using? I have one off these lamps had to put it away because it leaks alot of liquid. Is this normal? It leaves every space wet, where I leave it. Please let me know what I should do.. I had a lamp that did that as well and realized it was because the room it was in was too humid. If there is a lot of moisture in the air the lamps tend to weep. Once they start, it can be difficult to get them back to normal, but generally wrapping them in a dry towel or putting them out in the sun seemed to do the trick! We have salt lamps all through the house. And we keep the one in our bedroom directly under the bed on the floor. (We have wooden floors) It adds a soft glow as a night light to see at night and keeps the ions negatively charge to help us sleep. I have one but it looks like a candle holder. Will it show positive results too with the candle in it? Yes! The heat from the candle will cause the salt particles to flow like they should. You will still get some benefit from this 🙂 I just love how salt lamps look and of course you can leave them on without worrying about fire. I have a prayer plant in my house and have had it for 8 years. Since I got my salt lamp it seems like it is dieing, have you heard of that happening. it could be that the plant is sensitive to the salt in the air perhaps? As salt lamps heat up, they definitely release salt particles into the air. That could be why it’s looking a little worse for wear! Does it have to be used in a smaller space ? Or could I use one on my desk in a large office setting of cubicles? I glanced at a lamp at my local Sam’s club. Any type of himalayan salt lamp will be beneficial for your health 🙂 I hope you give them a try! You say the benefits of the lamp don’t work until heated. Does it have to be heated by a light bulb or can the rocks be placed in a sauna? My dad bought me one for christmas and I didnt know anything about them. The benefits have been great I hate being away from it. Mine also has a small diffuser which I use every night. Thanks for the information it was great to learn why it works. I’m really happy that you love your himalayan salt lamp! They’re really amazing aren’t they? Great article! I’ve been meaning to purchase one for bedroom and living room as there are allergy sufferer in our home, do you know if one should consider buying organic. I’ve been doing a ton of research and some claim to be 100% organic. Thoughts? Interesting! I haven’t heard of organic himalayan salt lamps before. What I do recommend is getting one from a good source because some sellers try to sell inferior products. Amazon is a good place to explore 🙂 Organic though? I would be wary! Do you have any tips on knowing when we’re buying a good quality one or if it’s the real thing. I almost wouldn’t trust one from a store like HomeGoods/TJMaxx/Marshalls/Ross. But I’m ready to run out to HomeGoods right now to get one!